I've come to realize that one of the best ways to put my stamp on a room design, leaving the client with a one of a kind piece we can both be proud of, is to create that special stand alone piece myself. Yes, I usually get the initial idea from Pinterest or a DIY blog I've seen but I always change it up a bit to make it my own and to suit the client's taste and space. I'm currently working on a bedroom for a client whose style I would describe as ethnic eclectic. There was an empty wall screaming for something substantial so I started looking for inspiration. I knew I wanted to do something with African wood and glass beads but I wasn't sure of the specifics. I was inspired by this photo I found on messagenote.com. Next I went to Brooklyn Flea to find something to get me started. I came across a pair of vintage spears from New Zealand. They were beautifully carved and exactly what I needed. I took them to that empty wall then asked myself... Do I hang them? Do I place them standing in the corner? Now that the spears were hung on the wall, I needed to get beads. First I went to Beads of Paradise in NYC. They had a beautiful selection but it cost a little more than I wanted to pay. I knew I had to buy a lot because I didn't want to just hang one strand on the wall. 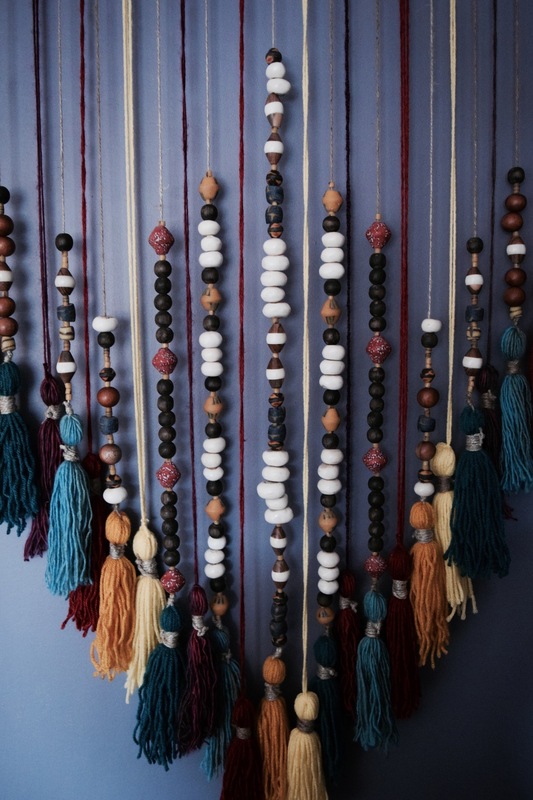 I wanted to mix beads and shapes to create my own strands using colors to match the decor of the room. I live in Harlem so I went into a couple of local shops and found a cool strand made of camel bone. Kaarta Imports and Export on 125th Street: The strands on the right of the $ sign are the camel bone. They cost $30. I also went on Esty.com to search for wood and glass African beads. I found some great choices reasonably priced from a shop named ColorSquare. So I did my first couple of strands then went back to the spears excited to see how it would all look on the wall! This (below) is the picture I took with my phone after putting a few of the bead strands up... womp, womp, womp. I was very underwhelmed. OH NOOO!! Not my beautiful bead wall! I pictured it in my head being bold and vibrant and now? Now I see... nothing special : ( I was in a bit of a panic but could do nothing about it at the time because I was on my way to Texas the next day with my friend Eric to attend the Design Campus conference at the Dallas Market. The Dallas Market is basically a huge building with hundreds of designer showrooms for interior designers to shop, it was like heaven. Even though this was just a trial run I could tell immediately that the beads did not pop against the wall and was not bold enough on its own. During the flight to Texas I told Eric about my bead wall dilemma and showed him the pictures. Thankfully he came to the rescue! He told me about a blog he read on making cool wall art with tassels and that maybe tassels would brighten up my dreary bead wall. The website is honestlywtf.com and it has a plethora of cool DIY projects! YAY! Fast forward three days later, during the last day of the Design Campus conference a huge snow storm hit the east coast and all flights back to NYC were cancelled! Both Eric and I were stuck in Dallas for an additional three days!! So, whats a girl to do...? I found a store that sold yarn and bought the necessary supplies to start making my tassels! I chose colors that matched the decor and rug in the room. I spent the entire last day in my hotel room making tassels and laying them out to see which colors I wanted to put together and in what pattern. To get the specifics on how to make them click on the link, honestlywtf.com. When I finally arrived back home to NYC I planned out how I was going to strand the beads and played around with the layout and look. Finally, I laid it all out on my living room floor exactly how I was going to hang it up. The top row has beads on twine because the yarn alone is not strong enough to hold the weight of the beads. The bottom row is only yarn and tassels, no beads. Here's a sneak peek of how it looks on the wall. I will show the entire room in my next blog post when the space is completely finished. So in the end I'm happy with how the bead/tassel wall hanging turned out. The design lesson I received in this particular project is that things don't always turn out as you originally planned, but if you remain calm (or at least try to), share with a trusted friend, seek a solution to the problem and adjust when necessary, things may turn out even better than the original idea. Plus I'm so excited I learned how to make tassels! I definitely see plenty more of them in my design future. Stay tuned for my next blog where the entire room will be revealed!